They had left the land of Egypt - a land of many gods. Osiris. Isis. Hapi. Uatchit. And others. And God had shown Himself more powerful than each of them. Ten plagues, each showing the Lord's dominion over one or the other. Each displaying His superior power over what the Egyptians worshipped. The children of Israel, His people, were enslaved for hundreds of years. Those who worshiped Him were forced to work in slavery. 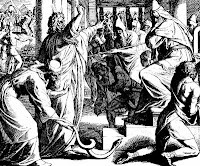 But His chosen people couldn't stay that way forever. For the Lord had promised He would let them go (Genesis 15:13-14). And in His holiness, He would NOT break His promise. And He got them out - but didn't leave them to fend for themselves. No - He guided them. A pillar of cloud to follow during the daytime and a pillar of fire at night. The essence of His amazing Glory to lead them where He wanted them to go. And He led them - to an unpassable spot. Ahead of them was the Red Sea. Behind them was the Egyptian army. There was nowhere to go. Nowhere to hide. Until God made the way. 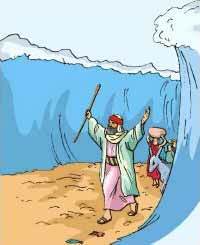 He parted the Red Sea. They crossed on dry ground. Every one of them made it to the other side. And every Egyptian was drowned. And we serve the same God. How has He shown His majestic holiness, His awesome glory, His wonders to you? How has He demonstrated His power over every other god? And what song has been - should have been - on YOUR lips because of it? Thanks, Anita! Feel free to copy my ideas. I am not in the least insulted. And so glad I could inspire you. Appreciate you stopping by! Btw, I also followed you on Twitter, @chariscol. As I read this, I reminded of God's faithfulness all along our journey in life even in those places we can't imagine why He would have us go this way. And some of those places you won't understand this side of heaven, Wanda. SO glad we can trust him. Thanks for stopping by!